Tropical Resort & Marina has a variety of apartment rentals available in lovely DeLand, Florida. Whether you're looking in to having an extended vacation in the DeLand area or a place to call home for a while, we will gladly accommodate you--and you'll be more than pleased with the beauty of our property and the variety of what our apartment rental spaces have to offer! We have studio and one bedroom furnished apartments featuring lake views or views of our beautifully manicured grounds. 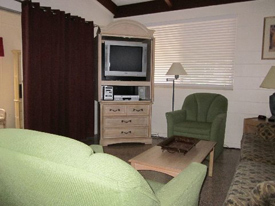 We also have large two bedroom apartment rentals, with clean well kept spaces for each occupant. Each one or two bedroom apartment comes with a kitchen and lounging area. What's more, the plentiful windows throughout our apartments give them a bright, clean, sunny Florida feel during the day. At night, draw the shades and get lulled to sleep by the sounds of the wind in the trees and the quiet but serene humming of crickets chirping in the night. For the families looking for an apartment rental in DeLand, we've got stunning three bedroom furnished apartments with two bathrooms, spacious living rooms and fully functioning kitchens and dining areas. Whether you're planning on living in the DeLand area or vacationing here for an extended period of time; in our three bedroom apartment rentals, everyone in the family can have their own space for quiet time and reflection. You won't find any crowded spaces here. With each furnished DeLand apartment rental, you can enjoy your very own front veranda with great views overlooking the marina and the surrounding vegetation. Breathe in the fresh air, and feel the cool breeze brushing over the great St. Johns river. If you're a nature lover, you will find great delight in the variety of species right outside your front door: from owls and other rare birds, to tortoises and deer. Right off the dock, you'll see plentiful fish schools of fish, bass for catching, and it's even common to see a manatee floating by now and then. When you rent one of our DeLand apartments, your pet is welcomed for an additional rate. Whether you're taking your pet for a walk, or going on a leisurely stroll by yourself, you'll never tire of taking walks throughout our immaculate property and manicured gardens. Make sure to allow time to catch a sunset once and a while, because we have arguably the best sunset view Florida has to offer, just steps outside your apartment rental. Other perks of our DeLand apartment rentals include: clean, efficient laundry facilities, a relaxing, solar heated pool area with lounge chairs and covered veranda, recreation areas, with basketball and shuffleboard courts, on-demand boat rentals (including kayaks, pontoons, fishing boats, and more), gorgeous river views, and a friendly, accommodating staff.